The Historic Howell Theater is a unique venue for birthday parties, corporate meetings, private film screenings, fundraisers, class reunions, bachelorette parties, church services, wedding ceremonies and receptions, rehearsals etc. We have two large stages that can accommodate plays, concerts, dance recitals, improv, yoga or pilates classes or any community event that needs seating for up to 215 people. Our children's birthday party package is a wonderful value and memorable day for your son or daughter and their family and friends. It includes pizza, soda, the movie of your choice and a small popcorn. We supply all the paper goods; you simply show up and bring the cake. The cost is $20.00 per person for the first ten guests with a minimum of ten people. The cost is ten dollars per person for all guests over ten (children or adults). All of our adult parties including birthday parties, rehearsal dinners, corporate events, meetings, etc can be customized with food, drinks and entertainment. And of course any event can include showing the movie of your choice. We can show power point presentations, audio video or photo slide shows on the big screen to make your meeting or party stand out. The Historic Howell Theater has hosted numerous fundraisers including not for profits, schools, sports teams and churches. 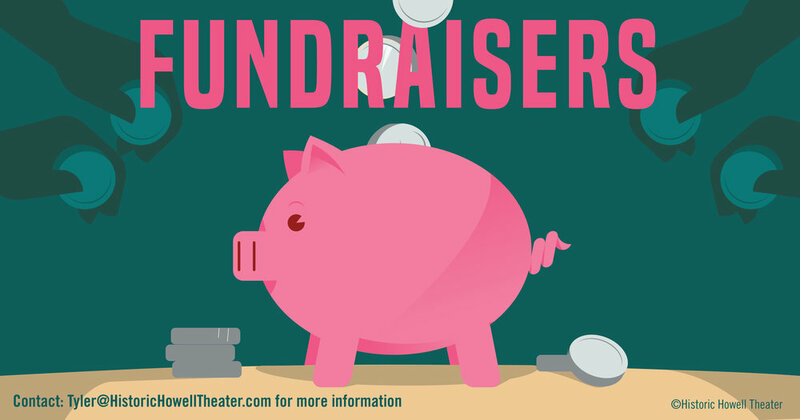 This collective experience has given us a lot of ideas and strategies for hosting a successful fundraiser. We can help you customize your event and share ideas to promote it and raise money. 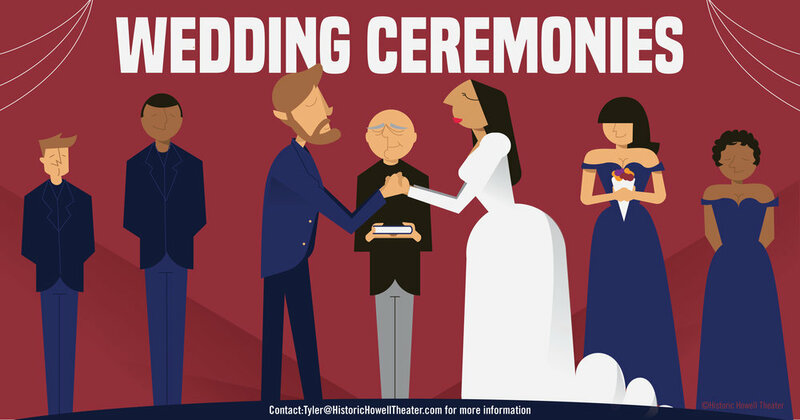 The Historic Howell Theater is the perfect venue for your special day. We will work with you and/or your wedding planner to take care of every detail from the rehearsal to decorations, themes, music, audio/visual, food, etc. We have a red carpet runner ( 4 x 20) available for your special event. The red carpet goes perfectly in our lower lobby where guests are welcomed like Hollywood movie stars. The red carpet runner is available for $25. The Historic Howell Theater marquee provides a unique way to advertise your event, say 'Happy Birthday' or announce your wedding date (ex: Joe & Jane Smith 6/19/2019). A custom marquee message is available for $35 per day. Theater One seats 157 and has a stage in the front that is 18 feet wide 8 feet deep and 16 inches tall, rounded in the front with steps on the side. Theater Two seats 212 and has a stage in the front that is 30 feet wide 9 feet deep and 18 inches tall with steps on the side. There is a back door with access to a staging area. The theater is 59 feet long from the front of the stage to the last row of seats. The center aisle is 40 inches wide. Both theaters have digital projectors, 7.1 surround sound and new screens. Our upper and lower lobbies can accommodate small dinner parties, larger grazing events and pre function receptions. We have the following tables and chairs that you may use for your function or event at no charge; Five 6 ft tables, Two 4 ft tables, Three card tables, Five round bistro tables and 40 folding chairs. Let us know your interest in hosting an event at the Historic Howell Theater! We respond to all inquiries within 24 hours.